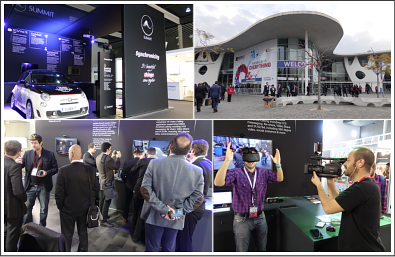 Summit @ MWC 2019 in Barcelona, Spain. Booth 5H31. 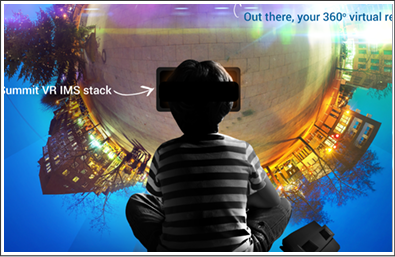 5G Edge Computing 8k VR calling, Chatbots with Mobile Connect and Enriched Calling, RCS Ai - live demos, Schedule your appointment now: Not only will you experience cutting edge chatbots for A2P, gaming (must experience), mCommerce real-time bot builders & beyond—resulting in bots accessible through the typical RCS smartphone instance, you will experience next generation RCS Business Messaging chatbots through real world robots, and incredibly, in the reverse form, as ethereal implementations in Virtual Reality. There will be nothing like it at MWC - don't miss it! Summit @ MWC Americas 2018 in L.A, USA. Booth S1760. 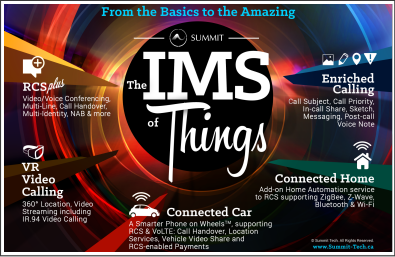 Summit's LTE and 5G IMS & RCS enabled services presented on live IMS RCS Cloud networks will be bigger, badder, and better than ever! Summit @ MWC18 in Barcelona Hall5 Booth 5H31. Imagine 5G, IMS, M-IoT and Rich Communication Services enabled through the rapid deployment of multiple IMS clouds supporting interconnect between service providers. You don’t need to imagine it—experience it. Summit Tech RCS Universal Profile accredited clients and network solutions - VIEW MORE. November 2017, Summit Tech attains certification as the world's first GSMA accredited RCS Universal Profile CPM based soft clent. Additionally, Summit's IMS/RCS Cloud solution, available through the Evolve network, attains GSMA provisional network UP accreditation, the world's first RCS Universal Profile accredited network runs on Summit IMS Cloud. 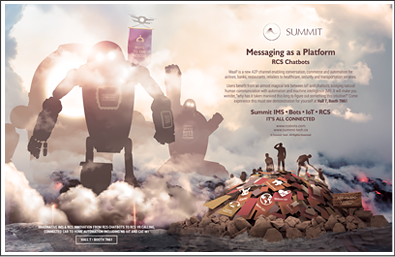 Summit Tech RCS Messaging-as-a-Platform (RCS MaaP) to be demonstrated at MWC17 featuring RCS Chatbots and RCS Plugins supporting stickers. Introducing the new Summit IMS / RCS for iOS with CallKit and macOS supporting RCS Universal Profile and Enriched Calling. Summit at CTIA Super Mobility in Las Vegas demonstrating real-time 4K mobile RCS VR Call and RCS IoT - IMS of Things. 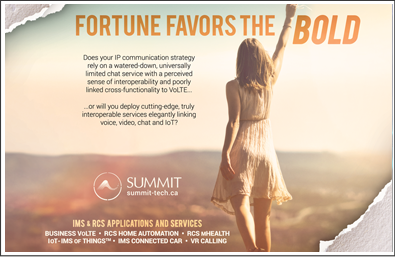 Summit Tech has been selected as the IMS/RCS client and Auto-Configuration Server (ACS) solution provider for the deployment of IMS (IP Multimedia Subsystem) by TELUS, a leading Canadian telecommunications company. The IMS client launch has set a new industry standard by simultaneously launching across the most diverse set of devices and platforms: iPhone, iPad, Android smartphone and tablets, Windows PCs and Mac OSX, with more to come. MTS selects Summit as the ACS solution provider and iOS and Android RCS client partner. Summit's RCS Stickers within chat messages now available including an RCS Sticker Shop: www.rcsStickers.com, a storefront customized and localized to operator requirements. 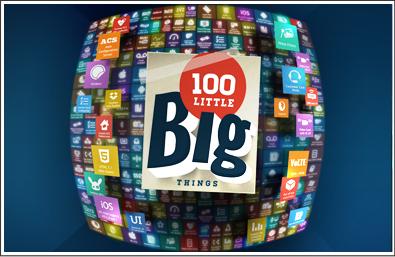 Users can add to their sticker collection from directly within their iOS, Android, Firefox, Windows or HTML 5 web clients. 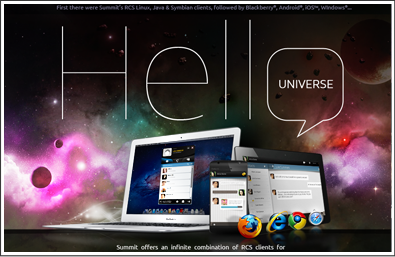 Telefonica selects Summit as the hosted RCS Web Gateway solution provider for web clients and FireFox OS devices. 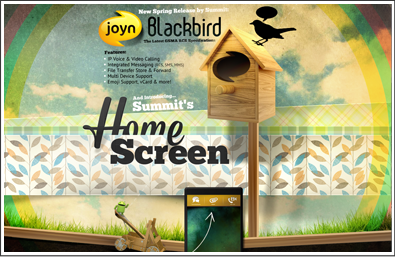 Summit RCS 5.1 and joyn Blackbird now available for Windows 8.1 Surface 2 (ARM) and Surface Pro 2 (x86) tablets. 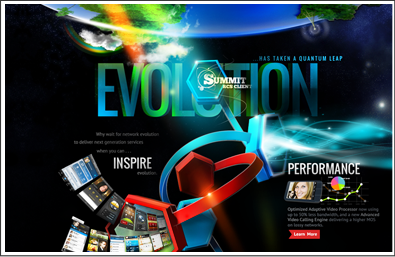 Summit's iPad and iPhone joyn app now more social than ever! 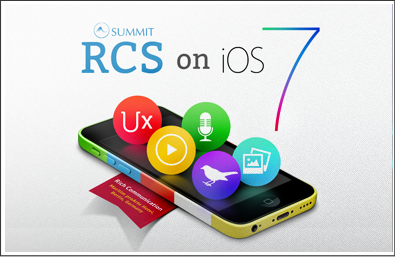 Now available Summit RCS Web client (HTML5) & Firefox OS joyn app. 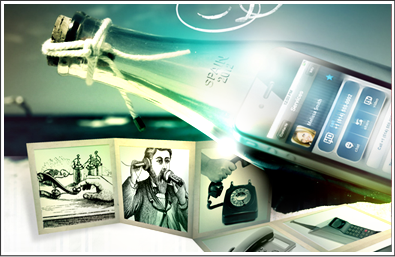 Designed with an advanced web-based user experience adapted for smartphones, tablets & desktops. 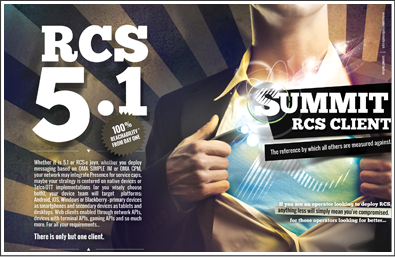 To complement our recent launch of RCS for Windows 8 - now available Mac OSX RCS 5.1 client . Summit Tech showcased Rich Communication Services leveraging RCS APIs at GSMA Mobile World Congress at: Hall 5 Stand 5MR80. 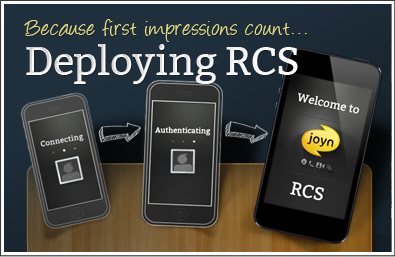 Demonstrations of RCS 5.1 and RCS-e clients on Android, iOS, Windows, Mac OSX, as well as web clients. 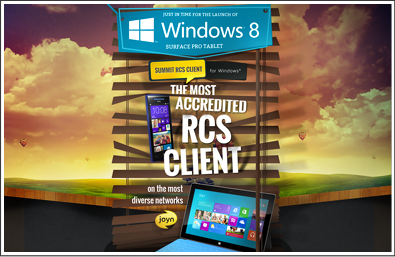 joyn Blackbird RCS clients available for smartphones & tablets including Windows 8 Pro Surface. Summit`s joyn for Windows is now supported on desktops (Windows XP, Vista, 7, 8), tablets (Windows Pro & Windows RT) & joyn for Windows Phone. 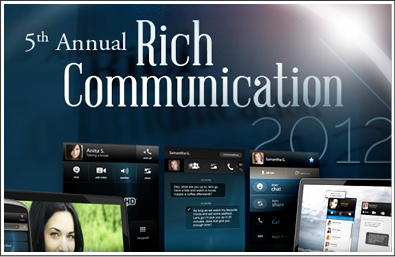 Visit Summit Tech at Rich Communication 2013 in Berlin, October 29-30th. See live demonstrations of Summit's latest RCS solutions from Web-based RCS cloud services to the latest iOS 7 RCS App and Windows 8.1 RCS client, including what was featured at the Connected Living pavilion at GSMA Mobile Asia Expo 2013; Summit's mHealth, RCS Enterprise & IMS Home Automation demonstrations - a huge success in showcasing the innovation and monetization possibilities available today on RCS. 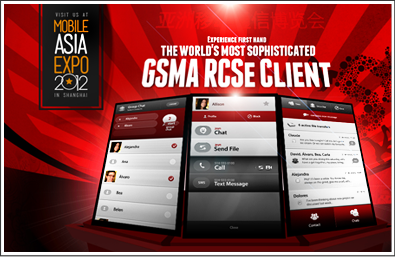 in Shanghai featured within GSMA Innovation City (Hall W3) presenting RCS MaaP & Chatbots. Live demos demonstring how operators can enable businesses to use chatbots within RCS messaging allowing users to shop, book taxis, order food, buy tickets and use virtually any mCommerce service. Summit @ MWC 2017. 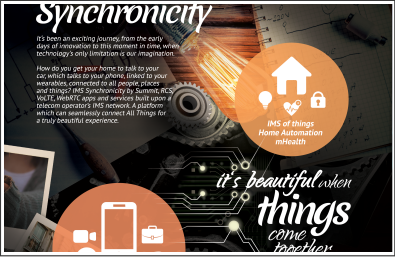 Imaginative IMS & RCS innovation from RCS chatbots to RCS VR calling, connected car to home automation including NB-IoT and Cat M1. Summit @ CTIA 2016. Advanced Communication featuring RCS Messaging-as-a-platform (MaaP) with RCS Bots for Connected Living, Connected Car and Virtual Reality Calling with support for VoLTE and ViLTE. Leading publications feature Summit’s RCS VR 360 degree calling, reporting how Summit’s VR connects people through IMS services. 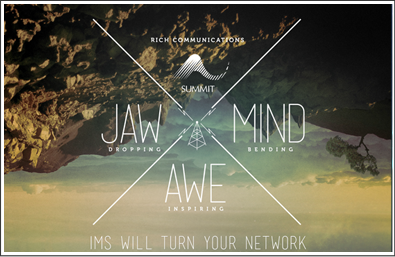 IMS will turn your network services upside down - and that's a good thing. Don't fall behind the competition. Lead. RCS on iOS 7. A must-see marvel. Why wait for network evolution to deliver next generation services when you can inspire evolution. 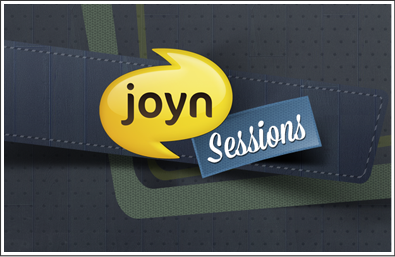 Quick access to a totally new and immersive joyn experience.